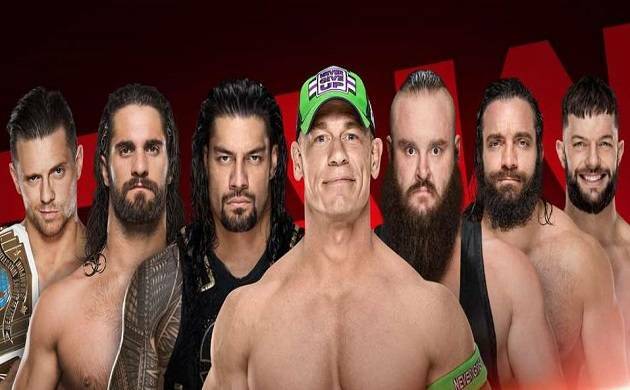 Roman Reigns, John Cena, Finn Balor, Miz, Braun Strauman, Elias and Seth Rollins will compete inside the Elimination Chamber to determine who will face Brock Lesnar for the Universal title at Wrestlemania 34. WWE is all set to present its much-awaited Elimination Chamber pay per view on February 25 from Las Vas valley. The RAW exclusive pay per view will feature two chamber matches involving both male and female superstars. Elimination Chamber is turning out to be an interesting event as for the first time ever female superstars will step inside the steel structure. Alexa Bliss will defend her RAW women’s title against Mandy Rose, Sasha Banks, Mickie James, Sonya Deville and Bayley in the chamber match. Interestingly, the men’s chamber match will feature seven superstars for the very first time. Roman Reigns, John Cena, Finn Balor, Miz, Braun Strauman, Elias and Seth Rollins will compete to determine who will face Brock Lesnar for the Universal title at Wrestlemania 34. The winner of the thrilling match will challenge the ‘Beast’ at the grandest stage of them all. Just a week ahead of the pay per view, WWE has announced a BLOCKBUSTER main-event for RAW. The seven participants of the men’s Elimination Chamber match will clash against each other in a gauntlet match. The match has already sent the fans into tizzy and they are unable to control their excitement. Seeing the top seven superstars compete in a match before the Elimination Chamber match is like ice on the cake for all the WWE fans. We just can’t wait for Monday night RAW to see the thrilling match.